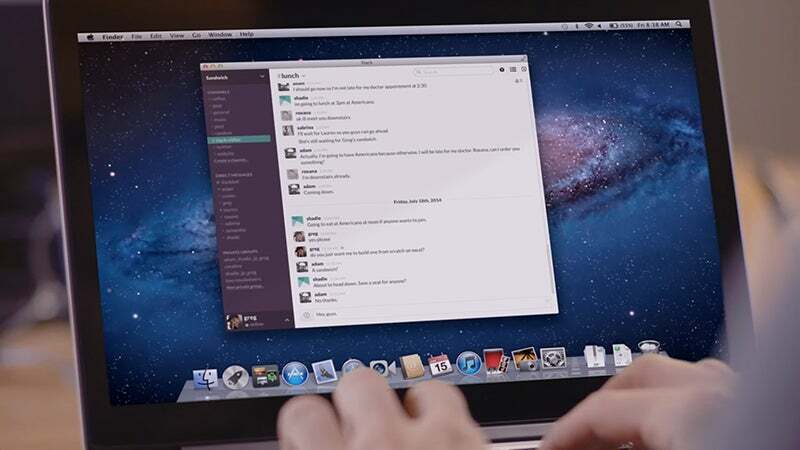 Slack continues to creep into offices and organisations worldwide, bringing a new and intuitive approach to old group chat model. If you've been signed up for the service at your workplace, then here are ten ways to wow your fellow workers with your Slack skills. 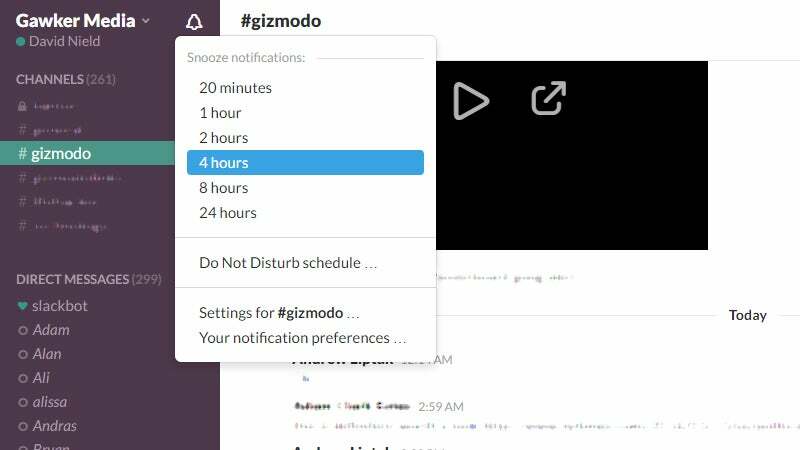 It's easy to get overwhelmed with notifications and alerts on Slack, which may be why the developers recently added a Do Not Disturb mode. When it's activated, you won't get any sounds or notifications on any of your devices, and your co-workers will see a little sleeping symbol at the side of your name. Click the bell icon (top left) to choose a time duration, or click on Do Not Disturb schedule and you can have it turn on automatically — very useful if you're in a different time zone to everyone else. You can also activate Do Not Disturb by typing /dnd followed by a time period into the Slack chat field. 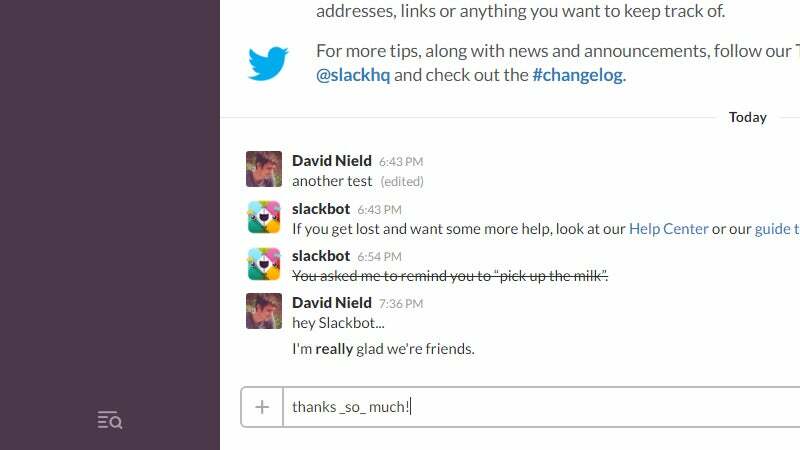 Slackbot knows all kinds of tricks and can be as useful as Siri or Google Now when leaving you reminders. Head into your direct message conversation with Slackbot, type /remind into the chat field and then leave some reminder text and a time. You'll see a confirmation message on screen. You can also leave reminders for other people and specific channels (just type /remind on its own to see various ways in which you can leave messages). If you want to see all of the reminders that are currently active, type /remind list into the chat field (you can delete them from here too). As with your regular search engine of choice, you can use operators to narrow down your searches in Slack (very helpful for those busier channels). For example, type has:star inside the search box to look for all starred messages or try from:username to look for messages from a certain person. 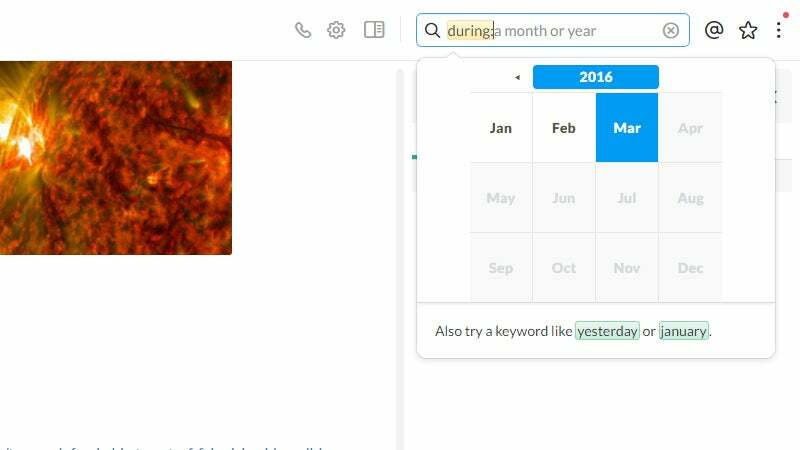 To see all of the operators available to you, type + in the search box: you can find messages in or to a particular channel, restrict your search to a particular range of dates, and look for messages with links in them. Related and recent searches pop up underneath as you continue typing. From Photoshop to Gmail, keyboard shortcuts can make a big difference to your productivity levels, and there are plenty to play around with in Slack too. For example, if you just typed something and noticed a mistake, press the Up arrow to get back to it. There's a full list on the Slack support site. The quick switcher shortcut is another useful one: press Ctrl+K on Windows or Cmd+K on a Mac, then start typing to jump to specific channels or message threads. You can use the Esc key as an easy way of marking all the messages in the current channel or conversation as read. 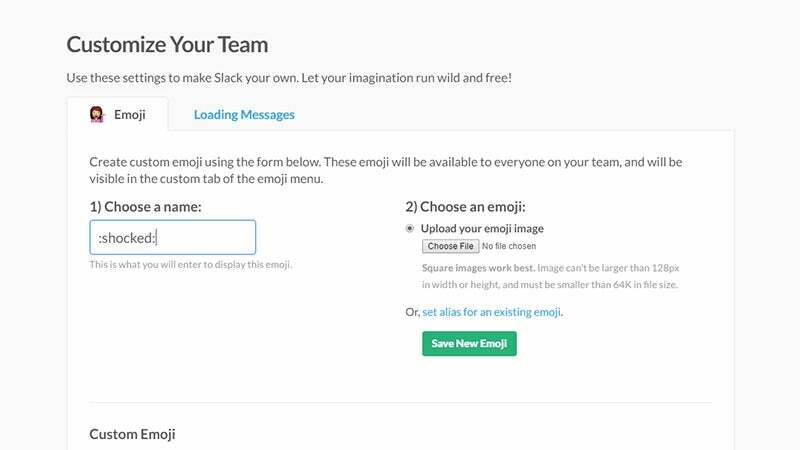 Everyone loves emoji and you can add your own to the conversation by opening up the main Slack menu on the web and choosing Customise (please note: the options you see here will vary depending on how your team's account has been set up). You can add customised loading messages from here too. All you need to set up a new emoji symbol is a picture of said emoji and a shortcut name for it — anything you create will be available to everyone on your team and will be added to the custom tab of the emoji menu (click the smiley face to the right of the message field to see all the symbols). Image and link previews are part of the appeal of Slack, but if you've got particularly GIF-happy colleagues or there are a lot of links to wade through then your screen can get very busy very quickly. Type /collapse to hide all image previews in the current channel and /expand to bring them back. There are a host of helpful commands that begin with the slash symbol — just type / in the message field to see them all pop up. Some of them may have been added by the people who set up your Slack channel, and any third-party plug-ins and add-ons will have similar commands of their own. In case you need help getting your point across, Slack supports the usual text formatting tricks found in many messaging apps: put asterisks around words you want to make bold, and underscores around anything you want to appear in italics. The tilde symbol (~) either side adds a strikethrough effect. If you need to create a message that goes on for several lines, then use Shift+Enter to add new lines without posting the message. It's also possible to create blockquotes by preceding text with an angled bracket (>) — to keep the blockquote across several lines, use three angled brackets (>>>). You can keep your place in a channel with an Alt+click (or Option+click) on a particular message — this marks it (and all subsequent messages) as unread, so you can easily jump back to it later. A long press on a particular message brings up the same option (and several others) in the Slack mobile apps. To change the way that Slack automatically marks messages as read when you jump back into a particular team or channel, open up Preferences from the main Slack menu then choose Read State Tracking. By default, Slack marks everything in a channel as read once you open it up. Slack has a distinctive default colour scheme, but you don't have to settle for that look if you don't want to. 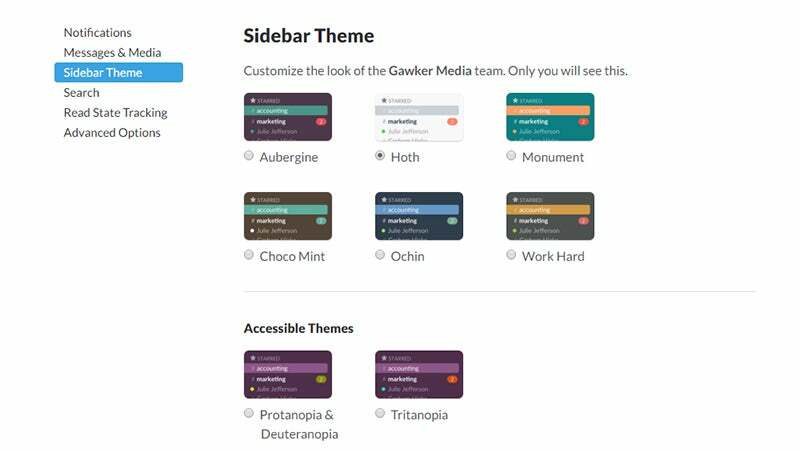 From the main Slack menu on the web, choose Preferences and then open up the Sidebar Theme menu — there are eight preset ones to choose from, or you can set the colours yourself. You won't suddenly change the colour scheme for everyone in your company — only you will see the new look — and each team that you're a member of can have its own appearance settings, which can make life easier if you're jumping around a lot between different Slack teams in one browser. Right-click on a time stamp, click on the options menu to the right, or (on mobile) long press to find the specific link for a specific message — you can bookmark this or drop it back into the channel, for example, enabling you to quickly remind your co-workers exactly what they have said in the past. Open up said link in a new browser window and you get a snapshot of the relevant channel at the time of the message, together with more information about the channel itself. There's an option to browse the channel by date too, if the team admin has made the relevant channel archives accessible.